The Randal Óg club was founded in 1953 as a football club. Football was played in Ballinacarriga long before that. There is a record of a team from Ballinacarriga playing under the name of “Randal Oges” and defeating a “combination team” who had men from three or four other parishes, back in 1905. 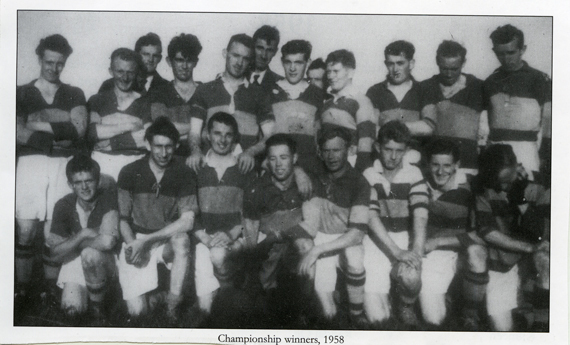 In 1953 first action for the team was in a local tournament, the Dunmanway Parish League. Playing as Ballinacarriga the team contested four qualifying games, winning three and drawing one, before losing narrowly in the final. The West Cork junior B championship commenced in April and with eighteen teams competing was not completed until November. 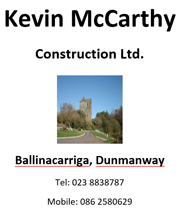 In the course of the campaign we had wins against teams from Kealkil, Rosscarbery, Drimoleague and Ballinascarthy before meeting near neighbours, Kilmeen, in the final on the second Sunday of November. After an exciting finish the full time score was: Randal Óg 1-1 Kilmeen 0-2. A few lean years followed and it was not until 1958 that we next contested a West Cork final. This time our opponents were Baltimore as a second championship was won on a scoreline of 3-3 to 1-1. We fielded a hurling team for the first time in 1966, and won our opening round championship game. The affiliation of under 21 teams in 1971 and 1972 was another step forward. We fielded our first under 21 football team in 1971 and our first under 21 hurling team the following year. Despite being well beaten in these years we achieved a notable double in 1973, winning both the under 21 B hurling and the under 21 B football championships. 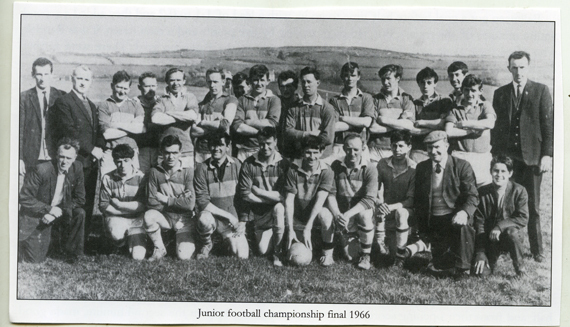 These victories set the foundation for further success and in 1976 we regained the junior B football championship. Then, in 1979, we won the junior hurling championship for the first time with a 1-8 to 1-6 victory over St. Colum’s in the final. Other milestones down the years. In 1987 we again won the West Cork junior B hurling championship and under new rules we were into county championship territory. We defeated Castlemagner in the quarter-final and Lisgoold in the semi-final but lost narrowly to Lisgoold in the final. In 1990 we won our second under 21 hurling championship with wins over St. Mary’s, in the semi-final, and St. Oliver Plunkett’s, by 3-8 to 2-9,in the final. This too was the year when one of the club’s long-term objectives was achieved. After years of work and planning the new playing was ready for use. In 1991 we won our third West Cork junior hurling championship but again lost out at county championship stage, in the semi-final being defeated by Whites Cross 3-5 to 0-9. We had a memorable year in 1992. It started on a Saturday evening in mid June with a very narrow win over Kilbree in a hurling championship second round game. We defeated Bantry Blues in the semi-final, to face St. Oliver Plunkett’s in the final in late August. It took four games to decide this fixture, with extra time in two of them. Crucial substitutions in the third replay eventually proved to be decisive and we got through on a scoreline of 2-11 to 2-5. This put us once more into county championship arena where we met Lisgoold, again, in the quarter-final. This resulted in another draw, but in the replay we built a first half lead which was never lost but increased late in the game and we won by 2-6 to 0-4. In the county semi-final we defeated Belgooly, 1-10 to 0-4. So we had nine championship games already played when we met Tullylease in the county final. We had won our first county championship. 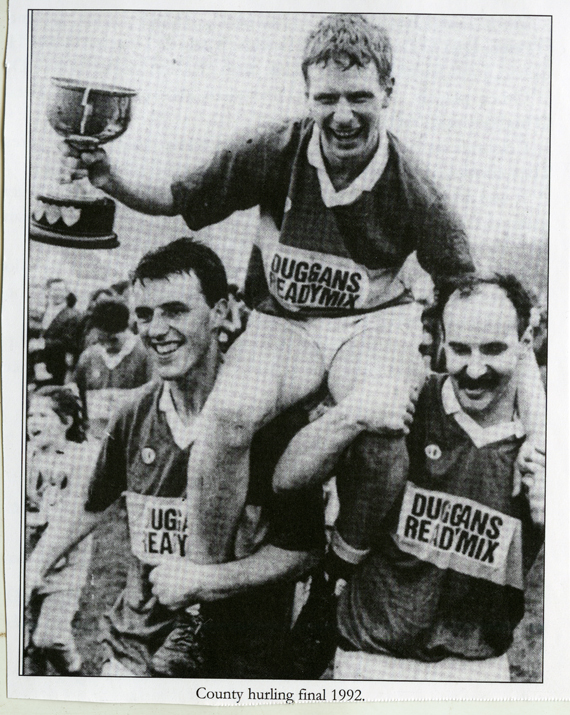 In 1997 we won the West Cork under 21C hurling championship defeating St. Mary’s in the final by 3-13 to 0-6. It was a busy year on the football scene in 1999. We won the West Cork junior B football championship, getting over St. James’, Barryroe, and St. Oliver Plunkett’s and then Clann na nGael in the final, by 0-10 to 0-6. In the county championship, we defeated Liscarroll and then Gleann na Laoi in the semi-final but lost to Glengarriff in the final. We were leading at half time but conceded two second half goals and at full time it was Glengarriff 2-9 Randal Óg 1-7. The millennium year of 2000 was another great year, particularly on the hurling front. Wins over Kilbree, St. Mary’s and St. Oliver Plunkett’s in the West Cork junior B hurling championship put us through to the final against O’Donovan Rossa. It was level at half time in this one but fairly one sided in the second half and it was Randal Óg 2-14 O’Donovan Rossa 2-6 at full time. Into another county championship, we defeated White’s Cross by 1-11 to 0-5 in the quarter-final and Lismire by 2-11 to 0-8 in the semi-final to get through to a final where we again renewed acquaintance with Lisgoold. We led by two points at half time and were ahead by only the same in the closing stages of the game. Two late points, one from a free, gave us a winning margin at the end. The full time score was Randal Óg 0-10 Lisgoold 0-6. An additional bonus was the winning of the once off county wide competiton for the Millennium Cup. This started in May but the final was not played until January 2001 in which we defeated Harbour Rovers from north east Cork by 3-17 to 0-5. At under 21 level we achieved another double, defeating St. Oliver Plunkett’s in the under 21C football final and St. Mary’s in the hurling final. In 2003 our under 21s had another successful year. The footballers, first into action, had “Round Robin” victories over Muintir Bhaire, Kilmeen and Goleen before defeating Muintir Bhaire again in the final by 0-8 to 1-3. Later in the year, the hurlers had two games, defeating Kilbree in the semi-final and then getting a narrow, 1-8 to 1-7, win over Dohenys to complete another double. We contested another county final in 2009. This was again in the junior B hurling championship in which we got the better of Gabriel Rangers in the qualifying round and beat Killavullen in the quarter-final and Belgooly the semi-final, but lost to Ballinacurra in the final by 4-12 to 1-20. The following year, 2010, was another successful year at local level with a West Cork junior championship double. In the football championship we started off with a victory over Bandon, then beat Kilmeen and Clonakilty before a narrow win over Clann na nGael in the final – 0-7 to 0-6. The hurling championship was played later in the year. We had wins against Bantry Blues and Ballinascarthy on the way to the final in which we defeated Kilbree by 1-14 to 0-4. The year 2011 saw yet another under 21 double. We played four games in the football championship in the springtime, with early round wins over Barryroe, Goleen and St. Oliver Plunkett’s. We met Barryroe again, in the final, and though trailing at half time finished strongly for 1-14 to 1-9 win. The summer was over before the under 21 hurling was played. There were good wins over Carbery Rangers and O’Donovan Rossa in the first round and semi-final and then early goals in the final against Gabriel Rangers ensured victory with a full time score of 3-10 to 0-7. In 2014 we won the West Cork junior B hurling championship for the seventh time. Again this played late in the year with our first game, a semi-final against Carbery Rangers, on the last Sunday October. We won this by 2-10 to 2-6. The final, against Diarmuid Ó Mathunas, was played a week later and it was an early goal that proved decisive as it was the winning margin at the Randal Óg 1-10 Diarmuid Ó Mathunas 0-10.